And for those days I like to do a little something extra. 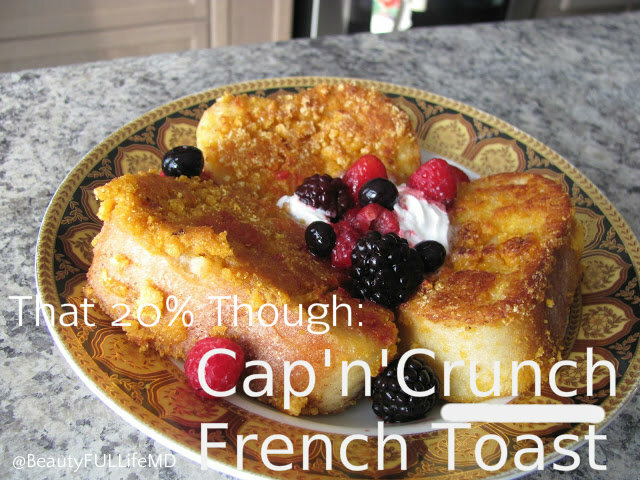 Cap’n’Crunch French Toast is one of those treats. Definitely not healthy, but 100% tasty. OK….let’s begin. Read on for ingredients and instructions. Use fresh berries or cut up any fruit you’d like to add at the end. If using frozen berries/fruit, portion them out and set them aside to thaw out. This is what I did. Preheat the oven to 150 F.
Slice up your bread if you have to. Make sure the slices are thick. Using a large ziplock bag, pour as much cereal as you think you’ll need into the bag making sure not to fill it more than half way. Set aside. In a large mixing bowl, combine the eggs, sugar, milk, vanilla and spices and whisk until it’s all well blended. Next in the ziplock bag, crush the cereal up into a coarse meal making sure there are still some bigger pieces. Empty the crushed cereal into one of your baking tins. Line the other two tins with wax paper. Soak each slice of bread until the mixture is soaked through (about 30 seconds or more per side) and then transfer it to the tin with the cereal. Make sure the bread gets completely coated, pressing each side into the cereal, then place the coated slices into one of the lined baking tins. Repeat until all slices are coated. Heat your cooking oil in a frying pan or skillet on medium heat. Cook each slice (for about 3minutes per side) and place fried slices into the other lined baking tin. Once they have all been cooked, place them into the oven to warm for about 5-7 minutes or until the tops are golden brown. Add the berries and any other confection that your heart desires. 1. The original recipe called for heavy cream instead of milk, and butter instead of cooking oil (I used a vegetable oil). I chose these substitutions because the original ingredients seemed a bit TOO unhealthy. I know this is my 20%, but I didn’t think I wanted to take it that far. Plus, even with the substitutions, this tasted AMAZING. And there was no shortage of sweetness. I have not tried the original, but I still enjoyed this version enough that I don’t feel like I’m missing something. 2. I recommend that you crush the cereal into more of a fine meal, rather than a coarse meal. I wish I had done that as I feel it would have been easier to coat the slices. Either way is fine, but I would have made that change. It will be less crunchy though, so if you like the idea of the crunch then I would stick with the coarse meal. 3. In my video, I didn’t bother using 3 tins (less dishes). I just put down a big piece of the wax paper on the counter top and rested the uncooked and coated slices of french toast there to wait to get cooked.